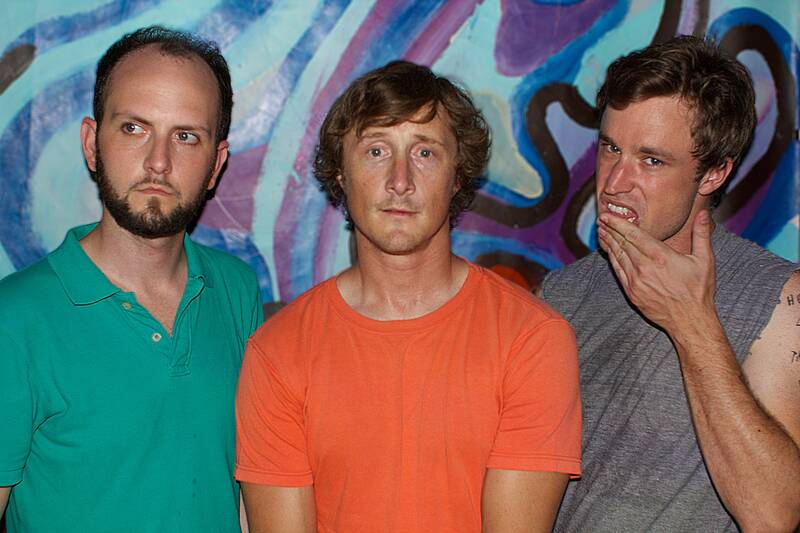 Matt Marlin, Joe Kremer, Jesse Hodges Pterodactyls, all. Sabine Rogers photo. The Brooklyn trio (which also includes Jesse Hodges and Matt Marlin), who are slated to play Vancouver’s Electric Owl on Dec 1 (HINT: to win a pair of tickets to the show and a copy of Spills Out, read or scroll to the bottom of the page), were traveling in a glamorous vehicle en route to their next show in Cleveland, Ohio. 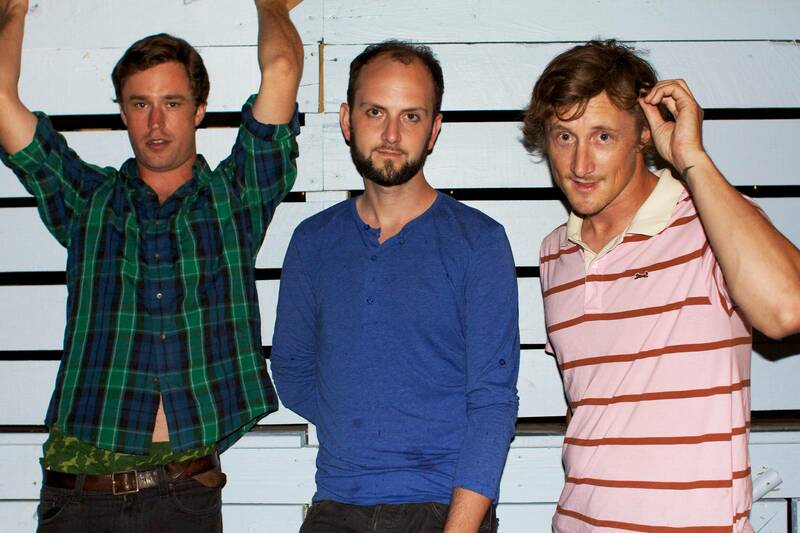 Pterodactyl’s “Spills Out,” released November 15, 2011. Rachel Fox: Are you a high school physics teacher? Joe Kremer: I was. I’d like to still consider myself a physics teacher though I’m not actually teaching currently. RF: A physics teacher who is in a rock band. Could you be a character on Glee? JK: That would probably work as a character. But I think it would have to be intriguing in other ways. RF: What did your students think about you being in a band? JK: They thought it was pretty cool. The very first year that I taught full time I tried to keep it a secret. I have a tattoo of a pterodactyl on my wrist and I tried to cover it up with a watch. It was really unnecessary and made things much worse – everyone thought I had this big, deep dark secret and then when I told them what it was, eventually, it didn’t affect them in any way. We had conversations about it, about what it was like to travel across the country with a band. It’s nice to be able to give that perspective to young people because they’re idea of what it means to be in a band is often kind of… distorted from MTV or whatever. RF: Sting was a teacher. So was Gene Simmons. There are others out there like you. JK: [Laughs] Like Gene Simmons! I did not realize that! That’s pretty cool. JK: Right. It was autobiographical. RF: I never took physics in high school but I probably would have if I thought my teacher was in a rock band. Spills Out is pretty atmospheric and it made me feel as though I was driving along a long desert highway, perhaps even in an old SUV with a purple trailer on the back. Can you talk a little about the sound of the album? JK: We recorded a lot of it ourselves. All the over-dubs we did in our practice space which meant that we had all the time to do whatever we wanted, so it’s very dense. There’s a bunch of different instruments and different vocal parts because we had the time to figure that out and find a place for it. We weren’t trying to make a record that sounded like one thing in particular. There’s a whole lot of contrasting elements from one song to the next… it’s supposed to be a little adventure. It’s definitely atmospheric, like you said. RF: What can our readers expect from a Pterodactyl show if they haven’t been to one before? JK: That’s an interesting question, actually. If they have been to a Pterodactyl show then they probably expect something that they’re not going to get. We used to be a really “noisy” band; there’s still that element in the show but we’ve really tried to highlight the singing. In all the songs there are parts where all three of us – and our new addition, Duncan Gamble – are singing together in four-part harmony juxtaposed with Sonic Youth-y, more classic-sounding guitar stuff. I’ve known Duncan since I was 15; he’s a great, energetic piano player playing on a keyboard that makes electric piano and organ sounds. He splits the parts between those and it really makes things sound classic. It puts Pterodactyl into a different context in a really nice way. We can still do the noisy, high-energy stuff, and there’s an organ there to put a little spin on it. 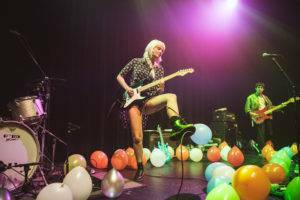 Sometimes it’s pretty raucous with the soaring vocal harmonies over the guitars. Definitely, what’s most distinctive about the group these days is trying to put together these choral performances night after night. RF: Are there any initiation rights that come along with being the newest member? JK: The three of us all have Pterodactyl tattoos. If he ends up being a mainstay, I bet he’ll end up getting one. JK: They’re not exactly matching but they’re all the Pterodactyl logo. So yeah, it’s exactly like that but we get paid a lot less. RF: Maybe you should have temporary Pterodactyl tattoos for sale at the shows. JK: That’s not a bad idea. RF: No, it’s a million dollar idea Mr. Kremer. Then, everybody can join in the logo fun. “Spills In” is a song on the album, Spills Out is the name of the album – what’s going on with you guys and the spilling? See that Pterodactyl tattoo on Joe’s wrist? Sabine Rogers photo. JK: “Spills In” is not even really a song, it’s an interlude; they are sounds to shape the whole record. These days most people don’t even experience the songs [on an album] in this way, from beginning to end. For people who do, we like to craft the record so that it’s an experience to listen to. The two [instrumental] tracks are electronic music compositions that are mostly there to guide you into this darker place on the record, then guide you out again. Have you seen the album cover? 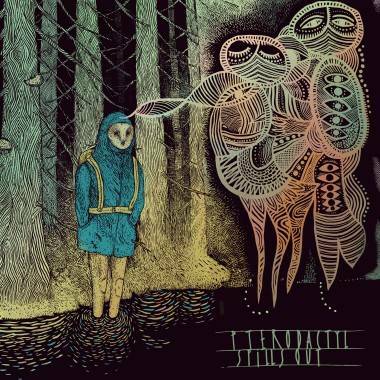 It’s a really beautiful illustration, this character wearing an owl mask standing in a dark and ominous forest with psychedelic images emanating from his head. The “spills in, spills out” idea is leading you into this forest into these visions he’s having… I don’t want to get too heady about it! It looks really classic, and classy. We’re all getting older and we just want to make things that are beautiful. RF: I guess I took the spilling thing too literally. I like musical interludes on albums; I think they had a different effect on vinyl and that you had to physically flip it over. The whole experience of listening to a record has changed because the format has changed. JK: I’m not lamenting a loss, because it’s still there of course, but it’s true that most people hear songs in bits and pieces even if they do end up hearing the whole record. They end up hearing it song by song, then one becomes their favourite and they just end up listening to it over and over again on their iPod. RF: What are you jamming to in the SUV lately? RF: Any parting words before your show at The Rickshaw? JK: I’m looking forward to the poutine in Canada. 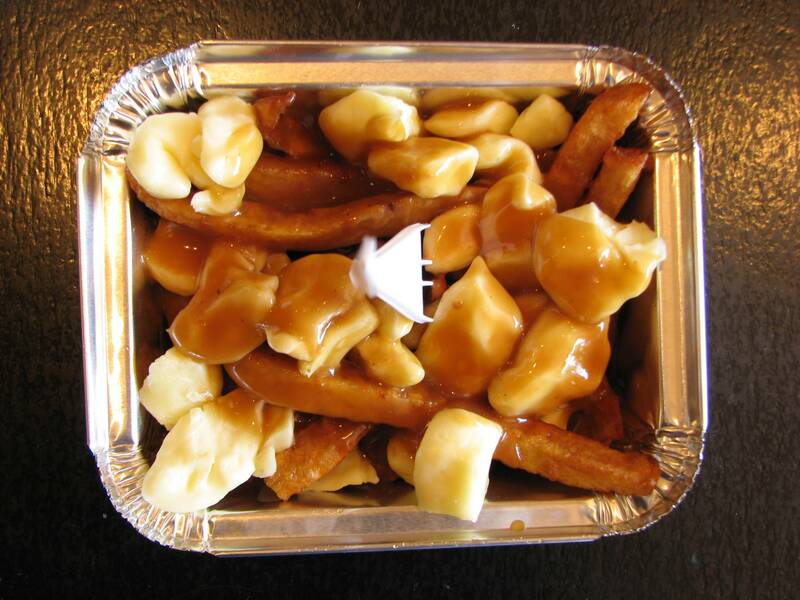 Poutine: The real reason American bands invade Canada. Rachel Fox photo. 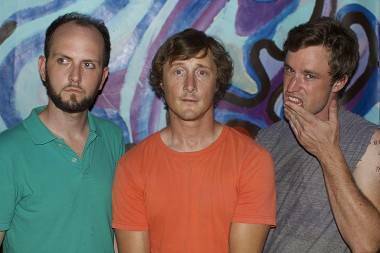 Pterodactyl contest: To win a pair of tickets to Pterodactyl at the Electric Owl on Dec 1 and a copy of their brand new CD Spills Out, leave a comment below. Contest closes On Monday, Nov 28 at 2 p.m. PST. Winner will be picked at random and contacted via email. Good luck! This entry was posted in interviews and tagged Electric Owl, Pterodactyl. Bookmark the permalink.